Thanks to all of you who came to the AGM and Welcome to London party, and our apologies to those of you who wanted to come but were unable to register due to space limitations. Huge thanks to James for organising a terrific evening, full of energy and enthusiasm. Following please find a link to the Minutes where you will find details regarding upcoming social events and new initiatives. Well worth reading, especially for those of you who couldn’t make the meeting. All are welcome at the quarterly management meetings, the next one to be held on November 5th (see Minutes for details). Please RSVP via the website for catering purposes. The UK Alumni Schools Committee (ASC) continues to be extremely active in assisting Yale with the important task of interviewing Yale College applicants, speaking at schools across the country and generally assisting British-based applicants to understand the opportunity that Yale offers to prospective students. This year, after a brief absence for maternity leave, we are delighted to welcome back Rebekah Westphal our Director of Admissions for the U.K. Rebekah was in town in late September speaking at various schools, attending our annual ASC party and participating in the Fulbright College Fair. The Fair, which now spans 2 days and attracts almost 5,000 registered attendees is the U.K.'s leading U.S. College event and the Yale Stand is always swamped. This year we had 12 volunteers from our ranks that kindly gave up part of their Friday or Saturday to answer the many questions about Yale that attendees had. They know who they are and thanks again to them for their participation, which was hugely helpful. I am also delighted to welcome to the UK and to our ASC my daughter, Alexandra Burston, who graduated from Yale this past year and will be studying for her Masters in Curation at the Courtauld Institute in London. She has kindly agreed to help me with some of the burgeoning administration of the ASC! We are always seeking further Yale College graduates to join our ASC. Most members would typically interview 2 – 4 candidates, depending upon their location and their availability. For those who are new to Yale interviewing, it is very straightforward. The Yale ASC website provides excellent guidance and a typical interview takes around an hour, with a report to follow which is filed online. For those interested in joining the ASC and providing a real service to Yale College, please would you drop me an email on asc@yale.org.uk. Richard Burston, ASC Director, U.K.
As we made our way through Yale, at different times, and on different paths, art was always around us, its presence strongly felt. Between the Yale Art Gallery and the Yale Centre for British Art, the graduate and undergraduate shows at the A&A, art was a part of our liberal education in many ways. To boot, the Yale School of Art remains one of the best schools in the country, and our alma mater has been the breeding ground of many of today’s most important artists and art historians. Building on the rich artistic and art-historical tradition of Yale, we are proud to announce the launch of the YCL Art Circle, a new section for alumni activities focused on the London art world. Our aim is to organise interesting events for you, the members of the YCL, introduce you to aspects of the London art scene that you might not otherwise have access to, but also provide you with unique or bespoke opportunities. We hope to be able to forge relations with artists and scholars alike, organise artists’ studio visits, private exhibition views, guided tours of shows and art fairs as well as art-related talks. The YCL Art Circle was unofficially launched last July with a breakfast and private view of the LOWRY exhibition at Tate Britain. We do hope you will join us at our upcoming events which at the moment include a guided tour of FRIEZE Art Fair (19 October), and a breakfast view and studio visits at GASWORKS (2 November). With your interest and support we hope to create a community of art lovers. Together we will navigate the art world and explore exciting and often challenging projects, exhibitions and ideas. We hope to see you at our upcoming events, so please make sure you check the e-mail updates and the YCL website! 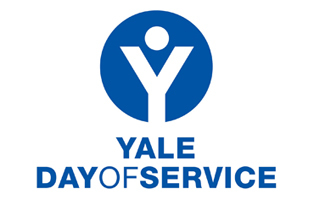 Please begin to make future plans to join us for the sixth edition of the Yale Day of Service, which will take place around the world on Saturday 10 May 2014. The Yale Club of London will organise service sites again, but we would like to start our brainstorming here in 2013 with a kick-off meeting that will take place in November. If you are interested in attending to share some ideas or generally learn more about the Day of Service, please contact Denise Holle or Erik Gustafson, who will communicate a date and venue in November to those who register interest. In addition, Yale and other US universities have seen a significant growth in the number of UK applicants during the past five years. Yet outside of greater London and the independent schools sector, few UK students consider university in the US. If you would be interested in speaking to UK state school students about Yale and other opportunities to attend university in the US, please register your interest with Denise Holle. There may be opportunities to work with other American university alumni clubs on such an initative, and the club would welcome a YCL coordinator for this activity. For further information, please contact click here to contact Nixi Cura. For the first time this year, the Yale Club of London is pleased to announce a special guided tour of FRIEZE Art Fair which will be taking place at Regents Park from the 17th to the 20th October. 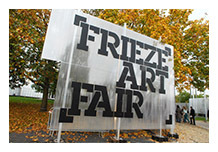 Join us on Saturday 19th at London’s Regents Park for a special guided tour of FRIEZE Art Fair. Art Advisor Beatrice Spengos (SY’02) will be taking a group of 10 people around one of the world’s most celebrated fairs for Contemporary Art. The tour will include a short overview and visits to a selection of gallery booths, as well as highlights from the Frame and Focus sections of the fair. Please note, the tour will be limited to FRIEZE Art Fair and will not include FRIEZE MASTERS. Should you wish to visit both fairs on the same day, you may like to consider the joint ticket option. Beatrice will be on site to discuss this fair with you as well, although no actual tour will be offered by the YCL Art Circle. If you are interested in the London art scene and would like to find out why this city is becoming one of the global centres for contemporary art, join us Saturday, 2 November at GASWORKS. This is a rare opportunity to learn about the activities of this famous contemporary art organisation, enjoy its most recent exhibition, and also meet the artists in residence and visit their studios. Alessio Antoniolli (Director) will greet us for a light breakfast from 10.00 am. Around 10.45, curator Robert Leckie will give us an introduction to The Lustful Turk, the first UK solo exhibition of Italian artist Patrizio di Massimo. Following that, we will proceed to the studios of the four artists-in-residence: Basir Mahmood (Pakistan), Love Enqvist (Sweden), Risang Yuwono (Indonesia), and Ibrahim Mahama (Ghana). The next YCL Management meeting will be held on Tuesday, 05 November 2013. All are welcome at these quarterly management meeting! We are always happy to have help in the running of the YCL, whether it is long-term, sporadic, or one-off. Please RSVP via the website for catering purposes. London & Capital along with Withers and Deloitte, and in association with Kellogg and Yale Alumni Clubs, would like to invite you to a complimentary seminar for Americans living and working in the UK on planning your financial affairs. -- IVY Young Alumni Drinks (Friday, 15 November): Come and join your fellow Yalies and other recent Ivy college graduates for the second Ivy Young Alumni drinks of the fall. Watch this space for a location update! -- Young Alumni Bowling Night (date TBC): After considerable enthusiasm after the AGM, the YCL is looking to organise a bowling evening. Please get in touch if you are interested or if you would be willing to help arrange this event. It promises to be a fun evening! -- YCL Xmas Dinner 2013 (first week December): Plans are underway now to have the Club's 10th anniversary Christmas Dinner at a central London site. Please hold the the dates of the first week of December (exact date to be finalised and confirmed soon) in order to join us to celebrate 10 years of this festive occasion. If you have any questions or would like to help in its organization, please contact Erik Gustafson at erikgus@aya.yale.edu.